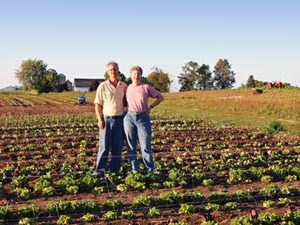 We are seasoned farmers who believe in building up soil and natural ecosystems that grow great vegetables and support a sustainable lifestyle. Co-owner and head farmer, has a B.S. degree in Soil Science and 26 years of experience growing certified organic vegetables. He chooses quality plant cultivars appropriate to the growing conditions on our farm and cares for them with proper fertility, irrigation, cultivation, pest control and harvesting techniques. Chuck also fixes equipment and communicates with wholesale customers. Co-owner and office manager, has a B.S. degree in Secondary Education, 7 years of experience in customer service, and 11 years as a chef and pastry chef in some of the best restaurants and clubs in Wisconsin. Terry writes the newsletters, responds to your emails, manages the Field Workers, the office, the CSA program and the Wednesday CSA box packing crew. You can meet us at the West Bend Farmer’s Market on Saturday mornings from 7:30 to 11:00 am, June thru October.